Omer Adam, currently the most popular recording artist in Israel, said that he turned down an offer to appear at the Eurovision this year since it would involve working on Shabbos. Adam was invited by Israel’s Kan public broadcaster to perform the opening act of Eurovision 2019 – taking place in Tel Aviv on May 18 – but declined because the rehearsals would be on Shabbos, ahead of the finale on Saturday night. Adam, 25, was born in the United States but grew up in Israel. He is not religiously observant, but makes a point of not working on Shabbos. Adam’s songs usually top the charts in Israel, while his concerts sell out in minutes. 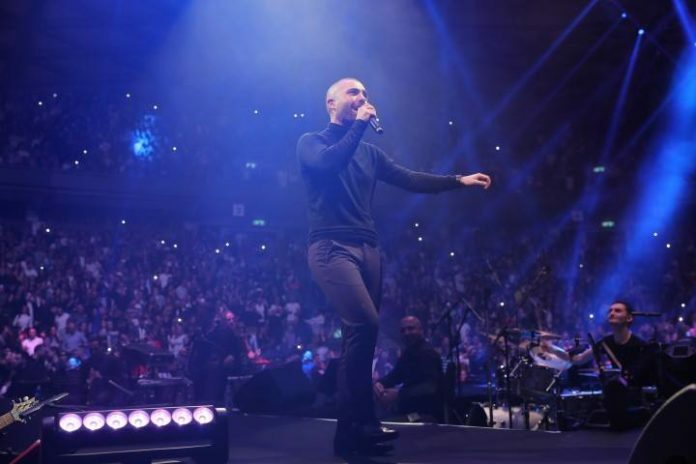 His biggest hit of last year, “Shnei Meshugaim,” (Two Crazy People) was the most viewed music video in the country last year with more than 48 million hits. Israel won the right to host the 2019 Eurovision after singer Netta Barzilai won the competition in May. Not sure why YWN doesn’t list this article as a KIDDUSH HASHEM, as this fits under the halachic parameters of defining it as such. Either way, kudos to this young man! My hope that this will inspire others to not work on Shabbos as well, even if they’re not religious. An act of amazing voluntary Kiddush Hashem. He wasn’t killed involuntary, rather he is choosing to give up an amazing opportunity. Granted he admits to not being observant but wow the impact this has. יישר כחך. To those who will criticize, would you have the strength to do this? Especially coming from and being in a non frum (non kosher) environment. Who here has had a serious shabbos temptation? The sad part is that the people pressuring him are the Israelis not the Europeans. This should teach a lesson to all of our YW regulars who are in the habit of speaking down on our “not fully frum” brethren. This is a tremendous kidush shem shomayim befarhesia. We need to all appreciate the mesirus nefesh involved by this young man and it should inspire us to gain a greater appreciation of our own individual shmiras shabbos. What is amazing about this is that he doesn’t claim to be a shomer shabbos quit the contrary yet he realizes the importance of standing up publicly for the kavod sheim shamayim. What can come from this is far greater than what most of us will accomplish in a life time. The criticisms that will surely come from the right to pour water on this great act will sadden Hakadosh Boruch Hu himself. This singer’s marvelous decision deserves great praise. I just hope that this incident — and others like it — won’t turn into an excuse for YWN to sneak in reporting on this upcoming “cultural event” that generally espouses all sorts of disgusting and debauched “entertainers.” This event, and so many others like it, are not grist for a frum website. For irreligious jews to have a feeling for Shabbos, to the degree of publically announcing that they won’t desecrate Shabbos and giving up fame only happens in Israel. The only place in the world that is culturally Jewish. Jewishness permeates land & air whether one likes it or not. So for millions of Jews living there Jewish identity is the norm. Irreligious western Jews living in the USA, Europe or anywhere outside of Israel won’t have the capacity to appreciate Shabbos — simply because culturally there is no Jewishness to be found even if the irreligious live in Jewish neighborhoods. So who gets credit for enabling this Israeli phenomenon? This is so heartwarming that a Jew who is not yet shomer Shabbos is making such a public statement about not working on Shabbos. Omer’s s’char for his mesirus nefesh and very public kiddush Hashem is surely tremendous. It would be wonderful if the planners of Eurovision 2019 would get the message and reschedule rehearsals and setup for Friday, completing everything on time so that no chilul Shabbos would take place. Definitely a step in the right direction. Take that Atheists.